Food Companies have to live up to the claims they put on their products. Which product has less fat? The serving size is based on the amount people usually eat. Percent Daily Value is based on a diet of how many calories a day? Which frozen yogurt has the higher amount of calcium? We should eat less amount of foods containing Fat, Saturated Fat, Cholesterol, and Sodium. Research shows that eating foods with high amount of Fiber, like fruits, vegetables, and grains, can lower the risk of heart disease and some types of cancer. Which bread has more Fiber? Less Fat always means Less Calories. Which cereal has less sugar? When you double servings, you double calories and nutrients. How many servings are in this package? How many calories are consumed if you eat 3 cookies? 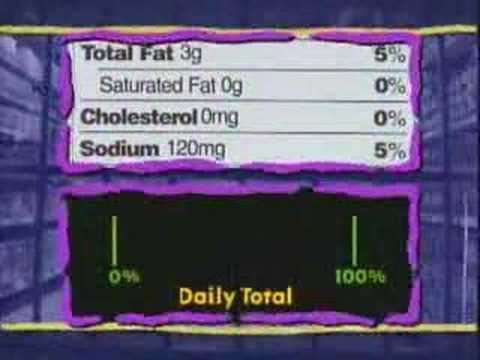 What is the Percent Daily Value for Saturated Fat? What is your Saturated Fat limit for the rest of the day?